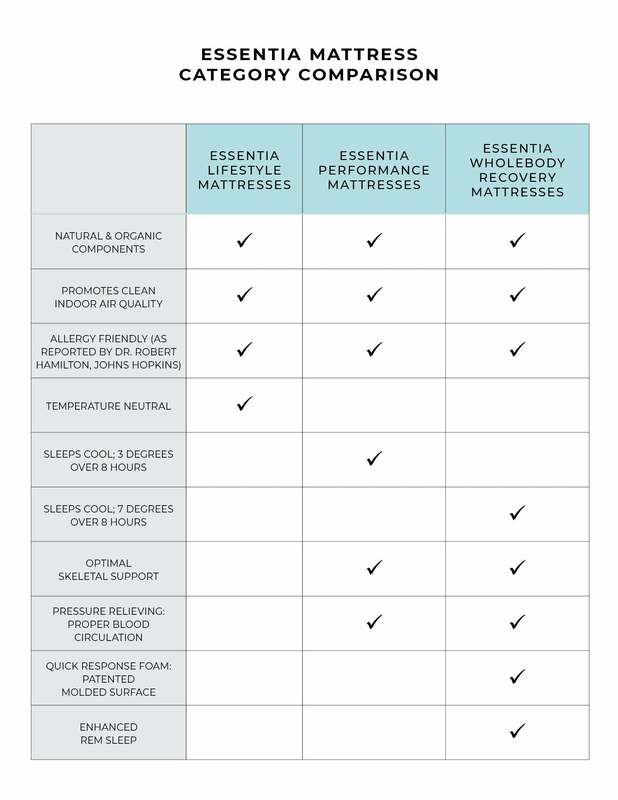 Eco-Friendly Foam Mattress - Dormeuse Fior | Essentia | Organic Essentia Mattress Inc. The Fior formula foam will indulge your senses, offering luxurious contouring support and pressure relief. Wellness never felt so heavenly! Unique to Essentia formulas, the deeper the contouring capabilities, the higher the density of our natural memory foam ensuring not just deep luxurious comfort but also proper spinal support. Supremely plush and contouring, the Fior offers the illusion of a plush pillow-top without any of the traditional pillow-top components that attract dust mites such as polyester or wool batting. Made in Essentia’s GOLS and GOTS certified organic factory using only the highest quality natural and organic ingredients the Dormeuse Fior reduces VOC exposure and promotes a clean air environment. Exclusive to the Wholebody Recovery category of mattresses, the Fior offers ultimate pressure relief for improved blood circulation, a natural latex support core ensuring enhanced daytime spinal hydration and patented quick response natural memory foam for extended REM and deep sleep cycles. Luxuriously contouring, the Dormeuse Fior’s unique high density formula truly supports and cradles every curve. 3 inch natural support foam gradually transitions to your body offering proper spinal alignment for support that doesn’t bottom out.